Get It While You Can...! Wow, there are ONLY 35 Limited Edition copies of The Rolling Stones Years remaining! The Limited Edition is the same 176-page book presented in an elegant cloth slipcase with foil stamping on the front and spine. 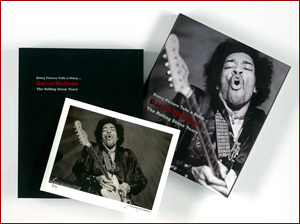 Each copy is signed and numbered by moi, who else, and each is accompanied by a beautiful 8×10 signed and numbered real silver gelatin custom print of my iconic photo of Jimi Hendrix. The number on the photo corresponds to the number of the book. The cost of the Limited Edition book + print is $350 and includes free shipping to all addresses worldwide. Like the late great Janis Joplin said, “Get it while you can!” Right HERE. « You love the book – now buy a print!